We’ve been in our winter destination for nearly two weeks now. It’s about time I got caught up on posting the rest of our trip! The day we left Nashville, we drove until time to quit for the night, stopping only for lunch in Jackson at the Catfish Gallery. The catfish wasn’t anything special, but we smiled all through our meal while listening to the wonderful southern accent of our very chatty and bubbly waitress. We made it to Brinkley, Arkansas and after much searching, found an RV parking area behind the Super 8 hotel. By 3:00 pm the next day we had reached Texas. That was the beginning of a long drive. We stopped for the night at the lovely KOA Mt. Pleasant RV Park. We broke the next day up with a stop in Dallas to do a tour of the 6th Floor Museum, dedicated to the story of the Assassination of J F Kennedy and located in the 6th floor room of the former Texas School Book Depository Building where the assassin fired the shots. We weren’t allowed to take pictures. We bought a couple of postcards. Find out more by clicking the link above. It was very interesting, but the stress of finding a place to park the motor home (it took about an hour) left me anxious to get out of the city and settled in for the night. We stayed at the Wetherford/Fortworth West KOA. The following day was another long driving day, across Texas. The landscape was littered with oil wells, and distant flames spewing from the refineries stacks. Very long box-car trains stretched along the tracks running beside the highway, and trucks carrying oil or machinery for often times crowded the highway and parking lots. There were also a number of small “RV Parks” along the highways, where seasonal oil workers parked their various temporary homes. That night we were in one of those parks, in Monahans, Texas after spending over an hour looking for the advertised RV Parks. There were very few amenities, but we had what we needed. It was raining and there was lots of mud. I was glad I had my rubber boots with me. When the rain stopped we took a walk up the road to the Travel Centre to get some exercise, snacks, and lottery tickets. We were in bed early that night, but still a little later getting away the next morning. At lunch time we pulled into the town of Sierra Blanca, hoping to find a restaurant. It turned out to be mostly a ghost town! There was one Mexican restaurant that was in one of the old buildings, a newer sign hung beside the original sign. There was also an Exon Station with a Subway. We enjoyed wraps there, with the Border Patrol officers who were taking their lunch break. Doing a search later, I found some of its interesting history. Shortly after one in the afternoon we had reached our destination for that day. We were back at Mission RV Park in El Paso! It felt like home! Jim had discovered that the RV was in need of one new spark plug and he hoped that the Repair Shop there would have what he needed. But, like the windshield wiper we needed last year, they didn’t. This time we were told that they only did work on things inside RVs, such as appliances. We did find a set of plugs at another location, but it was too big a job to do while travelling and nothing that was urgent. We did get to enjoy a lovely reunion dinner with Shawn, our new-found friend from last year in El Paso. It was so nice to see him. We regretted that his wife was unable to join us. We were in Deming, New Mexico for lunch the next day and happily in Arizona by mid-afternoon. Some highway signs across the desert. Our last stop before reaching Mesa was in Wilcox, home of Rex Allen, Sr. We did the tour his Museum before booking into the Grande Vista RV Park for the night. The Memorial continued in the park across the street. We were “home” in time to make dinner the next day. Thursday, Day Four didn’t get us very far, but that was by choice. After breakfast at another Cracker Barrel, we drove for another fifteen minutes to the popular themed attraction that was the reason for the campgrounds being full – Ark Encounter. Friends had told us about seeing it, so we thought we’d take a look. This mammoth wooden Ark, built to the size mentioned in the Bible – 510 ft. long, 85 feet wide and 51 feet high, sits high up on supports on a hill, outside Williamstown, Kentucky. It’s said to be the biggest timber-frame structure in the world, and for the price of $38 each, we got to do the tour through exhibitions and videos. The gardens on the way inside were beautiful, completed with some animals. It was interesting. I was relieved to learn that the “animals” in the many cages are not real, but created with 3-D computer sculpting, as are the animated people at the various stations. There are recorded sound effects, and voices. There were a few live animals in an open area. The work put into it is really quite amazing. I found it to be a good glimpse into what life was possibly like so many years ago, but the brochure states: “all three decks of the Ark are full of state-of-the-art exhibits that will amaze and inspire you to think differently about the biblical account of Noah’s ark.” I have to agree with this statement, but my different feeling probably isn’t what the creator of Ark Encounter had in mind. I felt that the videos that tried to convince us that everything in the Bible is true, confirmed as being the absolute and only truth, were propaganda, an attempt to create a profitable theme park. That might be just my opinion, but I saw few people looking very revered as they strolled through the exhibits. I’d be interested in hearing from anyone who has been on the tour. Tell me how it made you feel. When the tour was over, we were ready for the delicious buffet meal at the onsite restaurant. It was huge, fresh and inexpensive. And there were more beautiful gardens on the other side! The Kaslo River was often subjected to severe flooding during the 1800s. In 1895-96, during the rebuilding of the town after one such flood, the first hydro-electric system was included in the construction. It was privately operated by George Alexander. Kaslo Creek (River) was rerouted southwards into the current channel. In 1914 the City of Kaslo purchased Kaslo Power and Light for $27,000. It was upgraded in 1931 to be fully automatic. Another flood occurred in 1948 and in 1962 the power utility was abandoned, putting Kaslo onto the BC Hydro grid. Hiking trails began to develop along this abandoned land, but they were treacherous. In 2005 the many townspeople who like to use these trails formed the Kaslo Trailblazers Society and began the Kaslo River Trail Project. Many volunteer hours over the past ten years have resulted in two beautiful, safe hiking trails along both sides of the river, joined by red-stained wooden bridges at each end, both built by the volunteers. Where parts of the trail have become flooded in recent years, new higher links have been created and reinforced with wooden steps. Rope railings to assist with the climb, and wooden or steel benches, dedicated to donors, make the hike more friendly to people of various physical fitness. Animal-proof garbage cans have also been added to help keep the area clean. And the scenery is fantastic! We bought our second RV, a full sized motor home, in the spring of 2010. No, actually the second one was another wide-body, longer van that had a higher kitchen area, and an actual toilet, but we changed our minds about that and sold it. We thought we might like to spend a couple of months on the road, so we looked for something bigger, but we didn’t want to spend too much money before we knew if we’d enjoy that lifestyle. We searched e-Bay and RV Trader, and the local online buy-and-sell where we finally found what we thought we wanted, within our price range. We drove across town to take a look. It was old, a 1992 Thor Pinnacle, but it was low mileage and seemed to be in good shape. When we went inside the woman told us to take off our shoes because she’d just replaced the baby blue carpet. I wondered at the time how long baby blue carpet would stay clean. I also wondered about the smell of moth balls, but didn’t ask then. We went home to think about it. She said she needed to know soon because someone from down in the US was thinking of coming up to buy it, sight unseen. Somehow that didn’t sound right, but we didn’t question it. I think Jim looked under the hood, and checked the tires. We looked in the back compartment and were impressed with the size of it. We made the deal. She was almost too happy to have all that cash. Were we making a mistake? Were we too trusting? Turns out we were. At the safety inspection we were told that the tires would soon need to be replaced. They were starting to crack, but they’d be good for a few thousand miles yet. Everything else was good, as I recall. We took it to the local RV Maintenance Shop where the seller said she had annual inspections done, and talked to them about the fridge work, which they confirmed. They took us through a “tour” explaining how everything worked. They couldn’t get the generator to run. Then they told us that, even though there was no rust on it, the propane tank needed to be replaced because of its age. They claimed no one would fill it. That would cost $1,000! We thanked them and left, deciding that what propane remained in the tank would do us for our ten-day maiden voyage, and we would avoid needing the generator. I gave the motor home a good cleaning and stocked the cupboards. I searched for, and found moth balls hidden in the backs of drawers and cupboards. I used our air exchanger and fans to get rid of the odour. The day before we were planning to leave, Jim ran an extension cord from the house to the fridge, so it would be cold enough to hold a few food items in the morning. But in the morning the fridge was just as warm as it had been the night before! Our plan was to drive east through Quebec and then cross the border into Maine, after stopping the first night at my brother’s, just a few hours away from home. Before we got very far, the coach began to shake. Jim slowed down and it was fine until we reached the same speed and it started again. So we limped into the first city where we could get into a shop right away. The problem was a loose shock stabilizer. Fortunately, they were able to fix it and we were on our way again. That night it rained. When I opened my eyes in the morning, I spied a wet spot on the ceiling! We went to Canadian Tire for some caulking and an electric cooler, which we filled with a few grocery staples, and continued on our way. We found a little campground, John’s Camping, somewhere between Trois Rivieres and Deschambault, Quebec that night. We parked beside the man-made pond and were lulled to sleep by the sound of frogs, crickets and loons. That and the sun rising over the pond in the morning were the only positive things of note. Neither the TV cable, nor the WiFi internet worked from our site. We had to climb up the hill to the office, passing rusted and derelict pieces of abandoned machinery along the way. Our neighbouring trailers looked to be permanent, with strange additions. When we found ourselves at a KOA in Richmond, Maine the next evening, I tried to use the stove, but it wouldn’t light. We figured the gas gauge wasn’t right and we were out, so I had to cook dinner using the microwave. Later, Jim asked the campground manager if he could fill our propane tank, and he said sure, as long as it had no leaks. Well, that saved $1,000! It turned out it wasn’t even empty. I don’t know why I couldn’t light the stove, but it was fine afterwards. On the first cool night, we were happy to know that the furnace worked, but in the morning we wondered what the terrible smell was. Jim lifted the dining benches, which hid the furnace vent hoses and we were sickened to discover that they were chewed up and full of mice nests and dried feces! We spent a few hours vacuuming, scrubbing and covering the hoses with duct tape! Thank goodness that was the worst of it for the rest of that trip. We spent a couple of nights at the KOA in Saco/Old Orchard Beach, Maine, where we rode our bicycles to the beach and ate seafood. From there we went to Salem, Massachusetts, where we stayed for two nights in Winter Island Park. We caught the tourist trolley the first day, which took us to downtown Salem. We visited the Witch Museum and walked around the harbour where the Friendship ship is moored, but it wasn’t yet open for tourist season. The next day we caught the very inexpensive train to Boston and spent the day doing the City Tour that included a narrated trolley tour and a harbour cruise. Our next stop was Plymouth Rock where we spent a few hours, and then drove on to Middleboro for the night. We spent the next day taking care of domestic chores and touring the pretty town of Middleboro. We were in Mystic, Connecticut by early evening the next day. The following morning we rode our bicycles into the Village of Mystic Seaport, a very interesting, restored historic village. Our last stop was to visit with old friends in Bloomfield. We spent the night with them before heading for home. 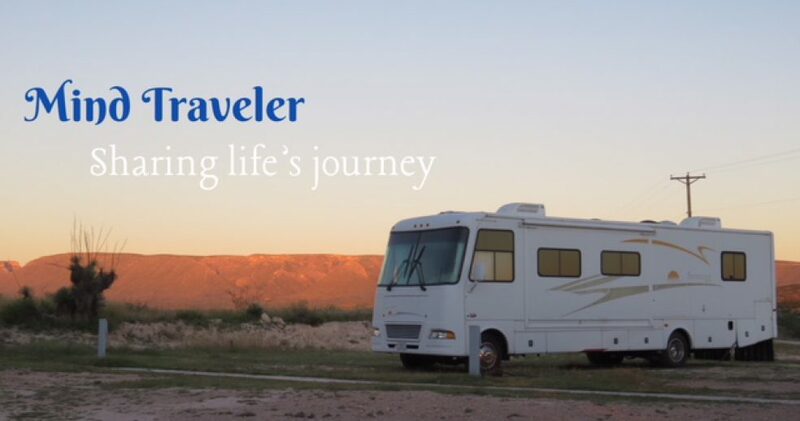 When we got home, we found a reliable RV repairman and learned that the problem with the fridge was only that the coach had been sitting on a slope in our driveway. The fridge requires it to be level. It wasn’t until our return from our second trip a few months later (two months traveling through the US to the Sturgis Bike Rally, San Francisco and up the west coast) that we discovered the loose rust in the bottoms of the storage bins, and consequently the major water damage that had been done to the bottom rails, the floor and the walls! $2500 later we had the motor home we wanted. Because we’ve not been traveling since our return from Arizona more than a month ago, I thought it would be fun to revisit our very first cross country trip to British Columbia in 2006. I did do a little blogging about it at the time, on a site that no longer exists. The only purpose of my blogging then was to keep family and friends informed of our progress. That trip was quite different from the ones we have taken since. Our first “motor home” was an old (1973 I think) high top Chevy camper van. It had a fold-down table with bench seats that could be converted, with great difficulty, into a narrow “double” bed at night, and a small kitchen with overhead cupboards that I hit my head on every time I prepared a meal. There was a two burner propane stove and a finicky mini-fridge. We removed the port-a-potty and used that room for clothing storage. There was no shower; no bathroom sink; no furnace. We had to depend upon public restrooms and campgrounds for personal care and laundry, but we ate many meals in that little camper. The purpose of our trip was to attend the graduation of my one daughter from the Kootenay School of Arts in Nelson, and the wedding of my second daughter, in Vancouver. We pulled a trailer containing our Yamaha Venture motorcycle to use for transportation once we reached British Columbia. We left Peterborough at 8:15 in the morning on April 13th and headed west, then north towards Elliot Lake, where we would spend our first night with friends, in the comfort of their apartment. By 11:00 it was time for a pit stop. We saw a sign for gas off to our right. Thinking we’d use the washroom there, we took the exit. This is what we found! Like the open air concept! It seemed the operating gas station was many kilometers further, so we decided to continue down the highway. A few kilometers outside Parry Sound, we found an information center with washrooms and picnic tables. After a 45 min. break, we were on the road again. In Espanola we filled up the gas tank at 106.9 per litre, for a grand total of $104.01 Yikes! That’s why the next day we would cross the border into the US. By 4:00 we were in Elliot Lake. The next morning we crossed into Michigan at Sault St. Marie and drove until 9:00 pm (Wisconsin time, 10:00 our time). We had planned to stop earlier but were unable to find a campground that was open. We thought we had it planned out with the KOA sites, but it turned out the ones they had listed were 30 or 40 miles away from the highway we’d chosen! Private ones weren’t open yet. There weren’t any convenience centres along the way either. When my bladder was about to burst, we finally found a motel and campground in Brule Wisconsin. The campground wasn’t actually open yet, but they let us park and use the electricity for only $10. The showers and washrooms were closed, so we had to make do with what we had in the camper. I sure was wishing we’d kept that port-a-potty! The temperature plummeted during the night and I vowed to purchase an electric heater before the next night arrived. April 15 – Easter Sunday, we spent on the road. The weather warmed up, so we postponed getting a heater. We parked for the night at the KOA in Bismark, North Dakota, where we indulged in hot showers before leaving the next morning. April 16 – We took some time to take pictures of these huge metal sculptures along the highway in North Dakota, and visited Painted Canyon and the Badlands. We were at the KOA in Billings, Montana by night fall. Later in the evening a thunder and rain storm blew through. It rained all night; the temperature dropped 10 degrees and the Weatherman predicted up to 14 inches of snow the next day! April 17 – We left camp at 9:00 am. By 10:00 we were driving up the mountains in a blizzard, with no snow tires! Fortunately, it didn’t last too long, but changed to rain off and on most of the day. The van really struggled going up the hills. By the final fill up for the day Jim realized that the gas octane he’d been buying was way lower than ours at home. When he used a higher octane at that fill, it made a world of difference. After spending a couple of hours in a Walmart debating with an employee about an exchange or refund for a defective camera that Jim had purchased a few months ago, and looking for a heater (they had none), we set out again. We’d thought we’d make it to Nelson that day, but it wasn’t looking good. We weren’t back on the road long before Jim thought there was a problem with the transmission. He stopped at a gas station to check it and put in some transmission fluid. Then it wouldn’t even start! He checked the batteries and didn’t think it was that. He thought it was the starter. He spent a half hour taking things apart to get at it and still couldn’t get it fixed. He finally decided he needed a new starter. Luckily there was an RV repair center right across the road so he walked over. The guy came over with his big service truck and boosted the battery. It was dead, but they discovered that the alternator belt was loose as well, which caused the battery to not charge. The cost was nominal. I breathed a sigh of relief. We finally got back on our way and stopped at 7:00 pm for the night at the KOA in Missoula, Montana. Apr 18 – At 4:00 pm our van was parked outside my daughter’s apartment in Nelson, BC where it would stay for the next thirteen days while we attended the family events and travelled around BC on the bike. It would be May 11th before our 10,000 kilometer trip would end, upon our arrival home. Looking back now, I wonder how we survived nearly a month in such tight quarters without any major conflicts! Of course a year later we did another month-long trip to Canada’s East Coast, that time on the motorcycle all the way and tenting most of the time.